This feature allows you to run experiments where segments of your traffic get the page rewritten with different settings in order to figure out which filters work best for your site. It reports to your Google Analytics account, storing data in a custom variable or content experiment. This will enable several filters needed for experiments including the Insert Google Analytics filter to insert the ga.js tracking snippet into each page. If you already have a tracking snippet on your pages, the lowest risk option is to remove it so that the one PageSpeed inserts is the only one. 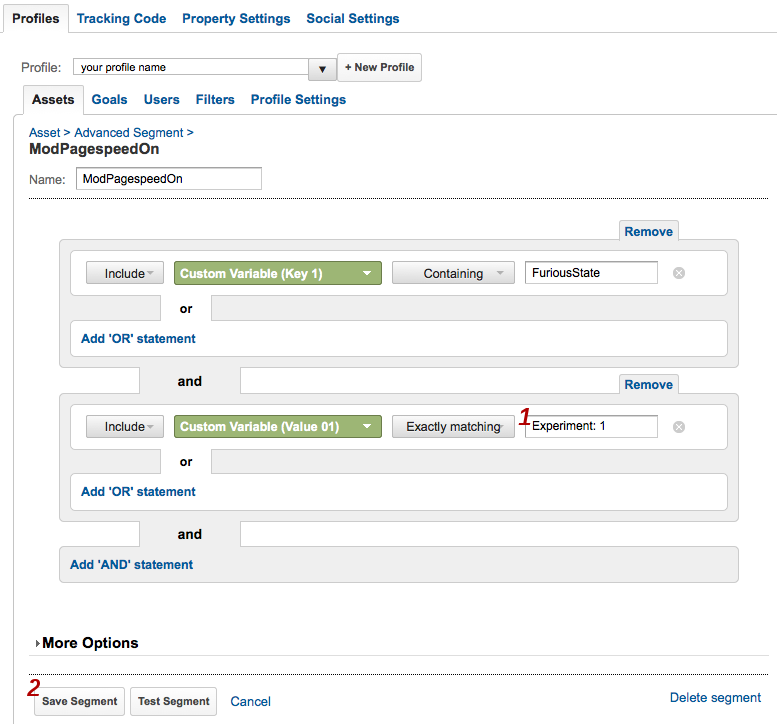 If you do choose to leave your existing snippet, PageSpeed will attempt to modify it to add experiment tracking. If you've customized your snippets you should manually verify that the modified snippet is still correct. A positive integer, unique across all experiments. You can't reuse ids from one experiment to the next; every id must be unique. If you stop running an experiment that had three experiment specs 1, 2, and 3, then your next experiment should start with id 4 or higher. An integer between 0 and 100 indicating what fraction of users should receive this treatment. If the sum of percent over all treatments is less than 100 then the remaining users will be assigned to 'no experiment' and continue seeing what they usually would. If the sum exceeds 100 it will report an error when parsing the config file. ExperimentSpec 1 above adds the optional setting default, described below, which tells PageSpeed to apply just the filters and settings it would normally apply. ExperimentSpec 2 specifies nothing and so turns off all filters. Apply the filters and settings that would normally apply. Warning: prior to 1.9.32.1 this setting could not be used in combination with any others. It would override any other configuration specified in the experiment spec, and the other settings would be silently ignored. This meant that in default,enabled=remove_comments the enabled=remove_comments would have no effect. As of 1.9.32.1, however, it is now safe to combine default with enabled=, disabled=, or options=, and it indicates that the current non-experiment options should be used as a starting point. For example, in default,enabled=remove_comments, you would now get the expected result of server default filters and options, plus remove_comments. Note that level= may still not be used with default. While all the other settings are in the form key=value, as in percent=42, this setting has no 'value' and is just default. A comma-separated list of filters explicitly enabled. For example, enabled=rewrite_images,inline_js. Equivalent to EnableFilters. A comma-separated list of filters explicitly disabled. Equivalent to DisableFilters. A comma-separated list of options to set. For example, options=JpegNumProgressiveScans=5,WebpRecompressionQuality=72. 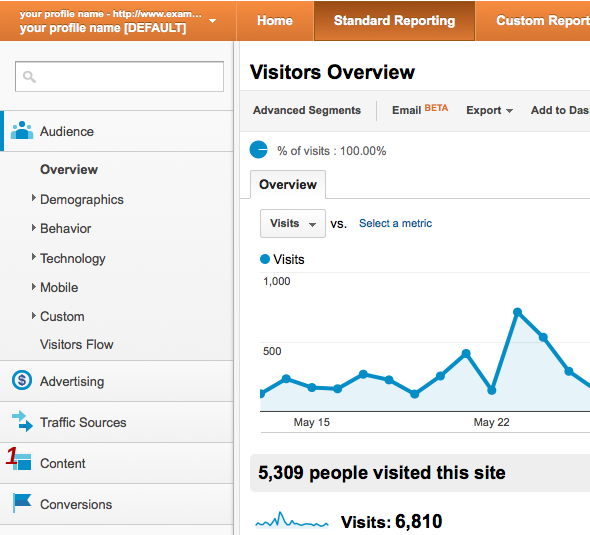 The Google Analytics ID you would like the data of this experiment reported to. If not specified, this experiment will use the Analytics ID specified with AnalyticsID. Visitors are assigned to ExperimentSpecs on a week-to-week basis. This means that when you finish one experiment and start another, it will take up to a week for repeat visitors to be assigned to the new experiment. Starting in 1.8.31.2 you can test experiment configurations on a live site before assigning anyone to them by creating them initially with a percentage of '0%' and then visiting the page with ?PageSpeedEnrollExperiment=<experiment_id>. This will set a cookie that assigns you to the group you're trying to test. You can stop running this test by deleting the PageSpeedExperiment cookie or loading the page with ?PageSpeedEnrollExperiment=-1. One tenth of visitors get the default configuration. One tenth get no filters. The remaining 70% aren't included in the experiment. All the other visitors will be unaffected. 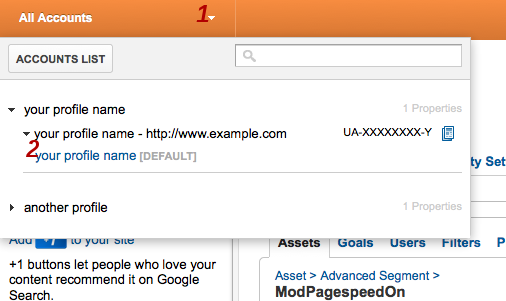 For measurement it logs to custom variable slot 3 of Google Analytics account UA-XXXXXXX-Y. While the RunExperiment feature supports testing many changes, as shown above, the discipline of changing only one variable at a time helps you see the effect and know where it's coming from. The only drawback is that sometimes two filters are more useful in combination, such as minification and inlining, where minifying brings resources down to the inlining threshold. There is also a tradeoff with the experiment percentages: a larger percentage means you will collect sufficient data for meaningful results more quickly but it also affects more of your users. If you're testing manually with query parameters to be sure your settings aren't making things worse for you, the downside of running with large experiment percentages is low. While you may not have determined the ideal settings right away, you're unlikely to have made things much worse. After you have been running an experiment for 24 hours Analytics will have results for you. The screenshots below walk through the process of creating a custom report to view them. 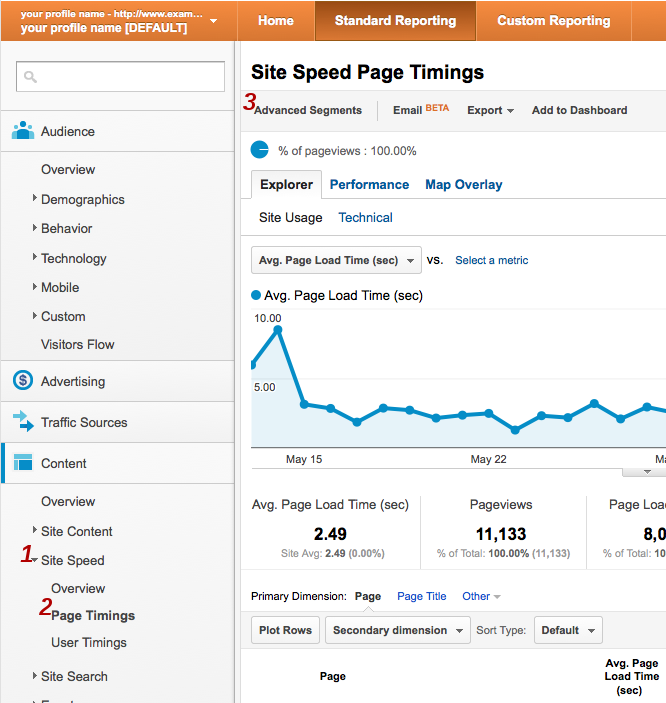 Advanced segments let you label fractions of your traffic. To view speed results broken down by experiments you need to add segments for each experimental group. Click here to import a segment for a sample experimental group. On the next screen you can adjust this custom segment to fit your situation. If you used a custom variable slot other than the default, which is 1, change Custom Variable (Key 1) and Custom Variable (Value 01) to the appropriate values. Where it says Experiment: 1 replace 1 with the experiment id you used. You also need to change FuriousState (our initial code name) to ExperimentState. Repeat these steps for the rest of your experiment ids. On the dropdown menu click the name for your profile. In the screenshot below this is labeled your profile name [DEFAULT]. This takes you to back to the Site Speed Page Timings page. Averages can be misleading, however, because one user who suffers abnormally high latency before the onload event will have an outsize effect on the average. Unless your sample is very large, such users can make an experiment falsely appear to be a success or failure. To overcome this problem a histogram is helpful. 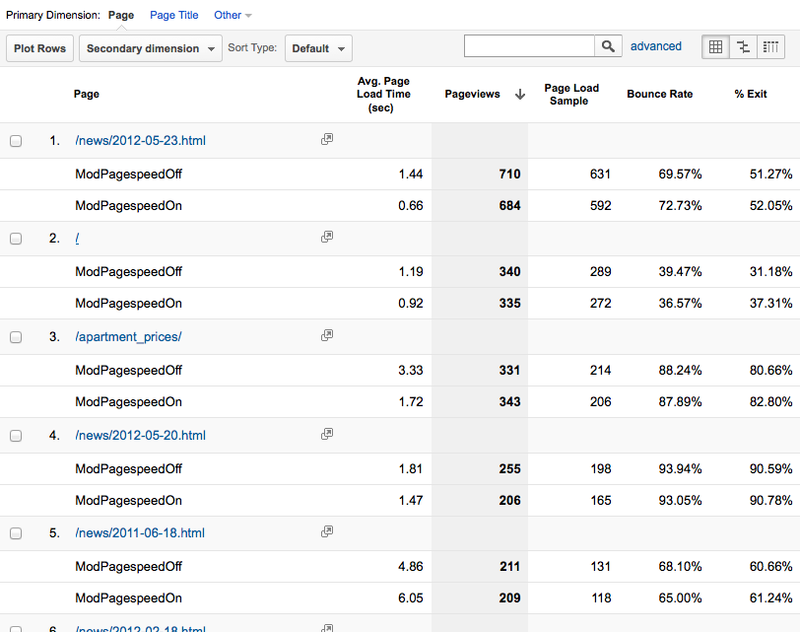 Click the Performance tab to see page load times grouped into intervals. To see more fine grained timing detail, click the + icon next to any histogram interval to expand it. 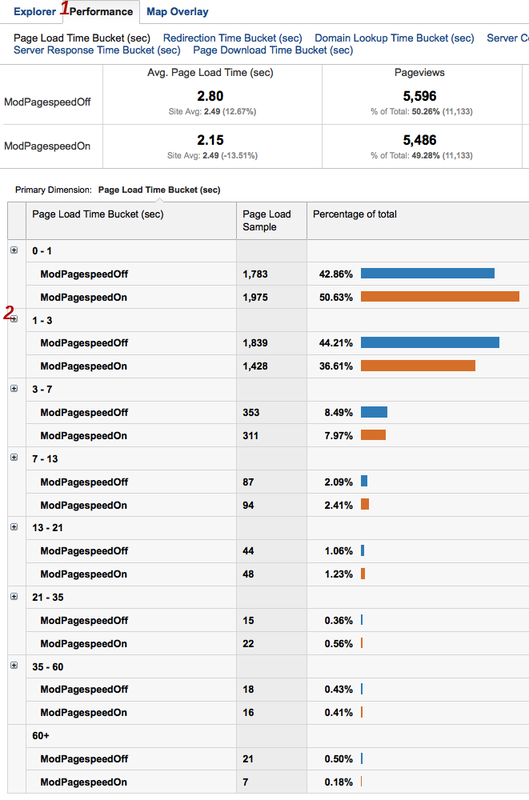 In this experiment PageSpeed appears to have moved about 8% of visits from the 1-3 second category to the 0-1 second one. For a simple mostly-text site running only the core set of filters, this is a reasonable result. As a next step the webmaster of this site might examine the filter list to determine if there are filters that are not in the core set which might be good targets for future experimentation. While you can use the Content Experiment integration with either ga.js or analytics.js we recommend using analytics.js if possible. Not only is ga.js obselete, with Content Experiments it requires PageSpeed to insert a blocking script, which slows down your page.